I’ve been mulling it over for the past couple months, while working at a new job. You see, when I rebooted Completely in the Dark in 2010 I had no idea where it was going. All I knew was I needed to get the family stories out of me. While writing those early posts, without diaries or journals to refer to, all I had were old photos and vague memories. Two years after Mom and Dad had died in 2008, those sense memories were overpowering. But memory is variable. It’s dangerous territory. And it’s mostly wrong. I do, however, believe in the power of place to bring meaning or consolation after loss, just because you experienced things in that place. Or a similar place. You see, I’m now working at an old St. Paul country club, founded in 1888. The place is dripping with history. Surrounded by shoe polish, after shave lotion, and hair tonic, I’m transported back to my earliest days. In the locker room where I work, with its gleaming mirrors and well-lit marble countertops, its racks of lotions and everything you’d need to clean up and look spiffy, I’m reminded of Louisville, Kentucky. Not exactly sure why Louisville—maybe it’s the combination of being near a big river, and the fact I wrote a couple posts about Louisville just recently. It’s also connected to my maternal grandfather, who had a part-time gig running car parts from Greensburg, Ind., to Louisville, while I rode shotgun. He was a big Republican in town and always had his shoes shined to look sharp, since he’d been everything from a gasman to volunteer fireman. 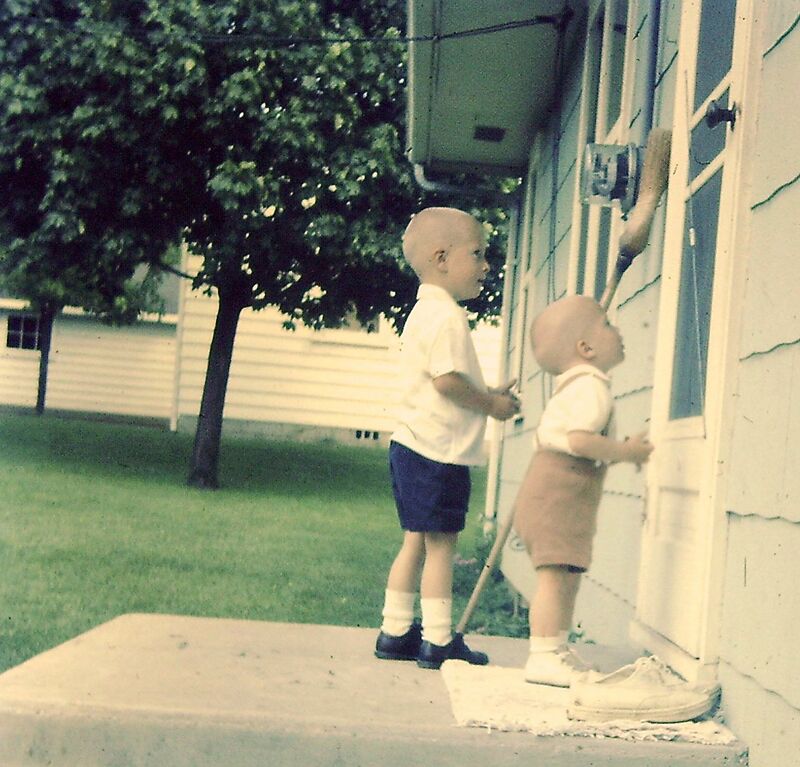 The smell of shoe polish and hair tonic connects me directly with that past (photo above left, my brother in front at our grandparents’ house in the early 1960s). The feeling is comforting and sad at the same time. I’m in a place I know will soon be gone (at least for me), but it’s like I’m being allowed to ruminate in it for one last time. I was born in Indianapolis. But we lived in Broad Ripple, a neighborhood north of downtown. I went to kindergarten there, then attended first grade at White River School. We lived close to the White River, on East 64th Street. It’s become a trendy, college-town area—at least that’s the vibe I got when my brother, his wife, and I visited just before we buried our parents in April 2012. Broad Ripple exists now as pure sense memory. For example, the city park just a block or two from where we lived—with trees that seemed gigantic and vast and through which the sun glittered. Kids had treehouses in that park, but all I knew then was it represented the future and the end—a sort of destination. I contemplated it many times over in my young days and I still come up with the same conclusion—yes, it’s a destination. I’m not sure what that means, but intuition tells me it is so. Or the smell of chlorine at the Broad Ripple Park pool, with ’60s pop music on transistor radios and the candy-color-striped beach towels that Dad laid out at poolside. 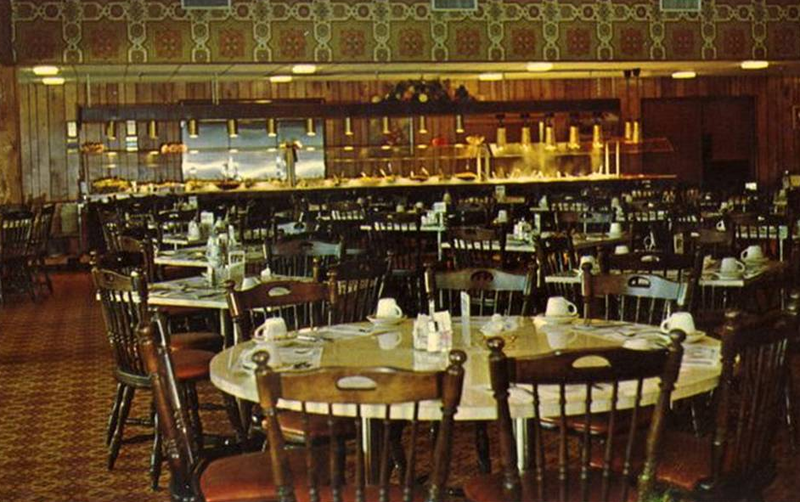 Or our family night dinners at the local MCL cafeteria (it probably looked a lot like the photo at right), with its burnished brass fixtures and glowing red heat lamps warming roast beef and popovers, apple pie for dessert with vanilla ice cream. For me, Broad Ripple will always be gaunt Methodist churches, ancient elms, maples, and oak trees, and brick porch ramblers with old coal bins in their basements. Trips downtown for dinner at Dad’s favorite Italian-American restaurant, with spaghetti and meatballs and antipasto salad served in large wooden bowls with lots of garlic and onions. 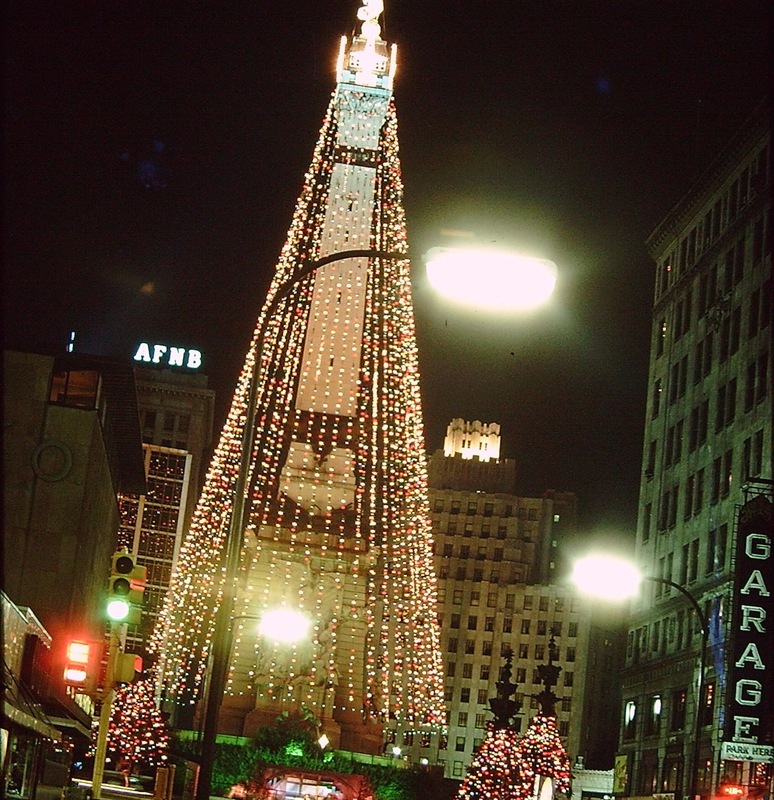 Or it meant Christmas shopping at Ayres and just seeing the sights in the city (photo at left from the early 1960s). On Saturday night, Jan. 2, 1993, we celebrated the 70th birthday of family friend John Rogers. It was a surprise party hosted by his children, with whom my brother and I grew up with on Casco Point. Brian, my brother, was there with his wife and young son. It was held in a poolside party room of a Mound, Minn., apartment building. After the gathering some of us stayed up talking and telling stories until 3 a.m.
That fall I’d left a corporate job in Hopkins, Minn., rented a place in St. Paul, and launched Available Light Creative, a desktop publishing biz. I’d moved into a Cathedral Hill mansion, the landlords of which quickly morphed into insane, money-grubbing sonofabitches. This place, here and now. When I get anxious about the future and think, “Will I always be here?” I remember that’s never been true. So many places I’ll never return to—most recently, the condo were I lived for ten years, where I was the year Mom and Dad died, and where I ended yet another relationship, sold or gave away some belongings and lost most of my income. But even in that last place—looking out a window I’ll never look out again, thank God—it seemed like I’d be stuck there forever. Even in April 2012, back in Broad Ripple, I’m happy to remember a lovely lunch with my brother and his wife, the day before we interred our parents’ remains. There we were, at our birthplace. But again, no going back, ever: even the three people at that table are now only two. After 27 years together, my brother and his wife are divorcing. When I stand by the gleaming sinks of the men’s locker room, it comes back—all of it. All the places, over decades. Sometimes I struggle to hold back tears. Sometimes I feel insanely happy. But this, too, will end. It will always be about Broad Ripple, I can see that now. I thought I was stuck, and felt hopeless. I now realize I’m still pushing ahead, and these spaces have only as much power as I allow them to have. That goes for the people connected with those spaces, too. I don’t know where home is. I haven’t found it yet. But I’m no longer standing on the headboard of my teenager bed on Casco Point, looking out the window for something to jettison me from the Family Project prison. Nor am I standing on a chair looking out the piano window of my St. Paul condo, again looking for escape. I can’t drive to an old haunt and look for a secret talisman, something to tell me where my life will lead me. In Japanese poet Bashō’s “Narrow Road to the Deep North,” he weeps for the loss of a traveling companion. Where is the road? The way stations? When would the freezing cold or oppressive heat let up? Then Bashō remembers the road up ahead. The best way to travel is with an open heart and mind. I know that. I struggle with it, but I know it deep down. 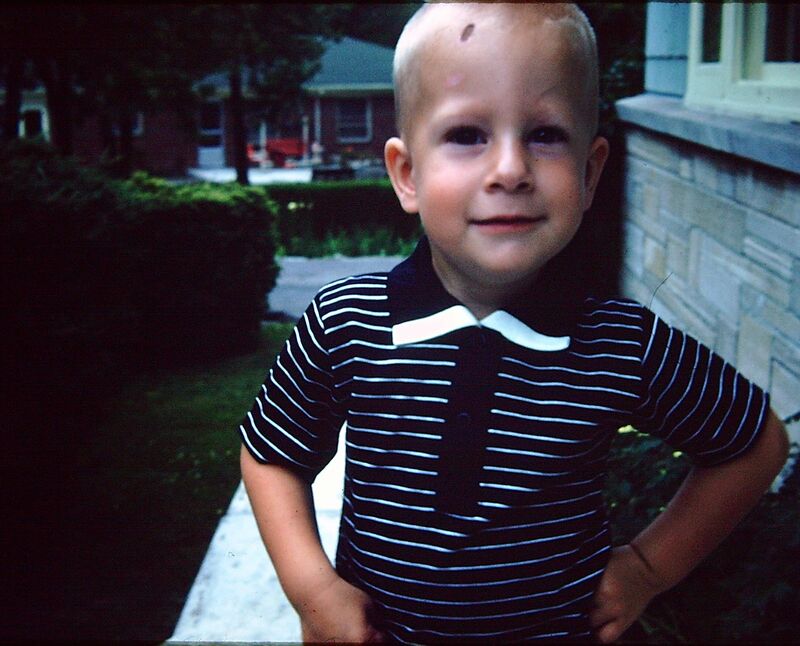 That scrappy little boy with the bruised head must leave Broad Ripple. He has to find his way through Indianapolis, to Maryland and Washington, D.C., and on to Minnesota with its glittering Lake Minnetonka and college and city life, where last I told the story, ending up in a studio apartment in Hopkins, Minn., in 1986—a pivotal year in that young artist’s life. 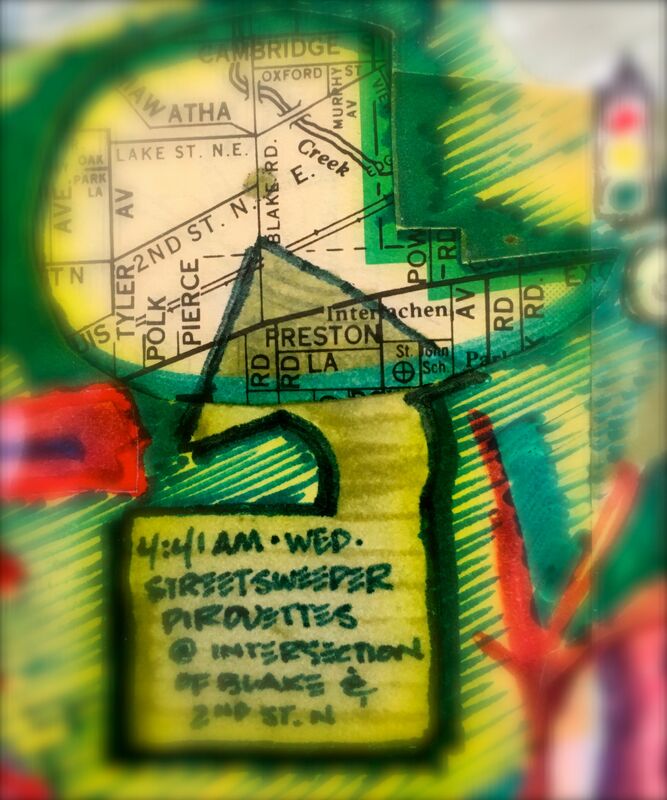 Back in 1987, on a Wednesday at exactly 4:41 a.m., the boy eyes a streetsweeper pirouetting the intersection of Blake Road North and 2nd Street Northeast in Hopkins, viewed out the sliding-glass patio window of his apartment. A space he will never inhabit again. All the apartments, houses, lawns, garages, corn cribs, barns, poolsides, backyards, docks, beaches … and, yeah, even country club locker rooms. Sometimes I wish it was more about the future, but it’s mostly about how it connects with the past. Broad ripples. Beyond where I could even imagine living. It has to be about that, always. ~ by completelyinthedark on September 9, 2016.